Epson Artisan 50 - INKSYSTEM USA | Save money on ink! 5 stars - "Epson Artisan 50 Inkjet Printer with CISS" by Sam J. , Written on 2012, 23:53/06/08 I like it because of speed. I even won't compare it with my previous one. 5 stars - "Epson Artisan 50 Inkjet Printer with CISS" by Octavio, Written on 2012, 12:50/11/27 Thanks a lot to INKSYSTEM for their top quality products, as I can deliver worthy printouts and save on each page. 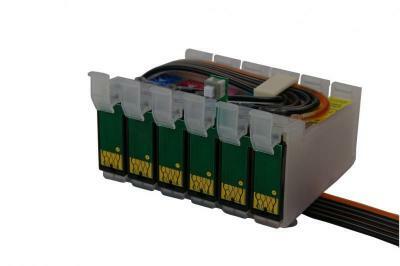 Buy Printer Epson Artisan 50 with CISS and make 30 times more quality prints for the same money! Pay only 0.04 USD for A-4 full color print! The device looks pretty mediocre, but it has a certain charm. The apparatus is heavy, its housing is solid. In the blue box there is a standard equipment set: a manual, CDs with drivers and software, power cable and an economical CISS from INKSYSTEM. The casing shape of this machine is very interesting. In the cross-sectional shape one can see a pentagon, with two faces at the top. The housing is made of plastic covered matt black, but the on the surface there are glossy sectors with pimples. The whole case is crossed with a horizontal gray line. There are some buttons with LEDs for control built on the left of Artisan 50. The review shows that the buttons can turn on and off the machine, stop it, ask for cartridges' change. All the rest have to be done with the help of computer; the model is equipped with strong horizontal and vertical telescopic chutes. There is an additional tray - for a CD. It is above the horizontal one. To the right from the tray information labels are placed. The machine prints qualitatively, brightly and sharply. The device is designed rather to print photos, however, the text by this printer model is considerably worse. Along the edges the letters are cut, their color is not black, but dark gray. So it is better to buy this printer not for an office, but for home. It is a perfect choice for amateur photographers in consideration of its high quality and inexpensiveness. 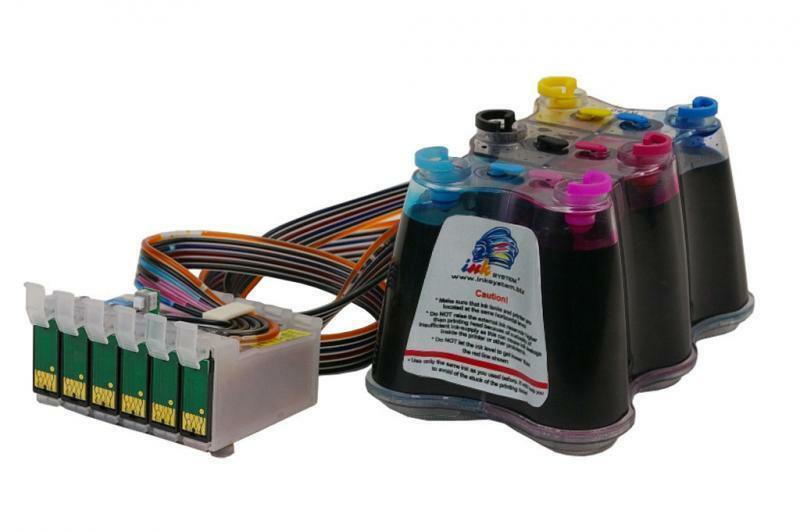 Printer functions with the EpsonMicroPiezo print head. The droplet size is adjusted depending on the type of area being drawn. If this is an ordinary background, the size increases, if some details - then reduces. The minimum droplet size makes 1.5 pl. In this model's printing system you'll find 4 standard colors CMYK + light cyan and light magenta. 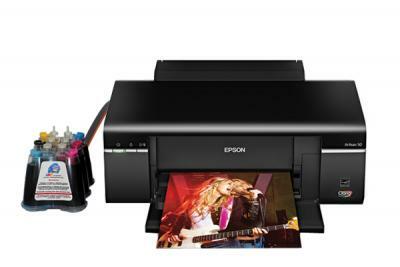 By the way, printer models Epson Stylus photo R280 and Epson Stylus photo r260 are no less popular. Having considered all sides of the Epson Artisan 50 printer, the survey proved that the device is perfect for users who prefer a good reliable device for printing photos without much functional excess. The apparatus does not posses office skills, so it is preferable to buy a printer of this model for reliable photo printing at home. Print speed is high, but considerably below the manufacturer's promises. I like it because of speed. I even won't compare it with my previous one. Thanks a lot to INKSYSTEM for their top quality products, as I can deliver worthy printouts and save on each page.